The proposition sounds far-fetched: Build a home in Boston so efficient that it produces more energy than it consumes, and price it for less than $400,000. But on Tuesday, Mayor Thomas M. Menino will kick off a building program designed to do just that, at a groundbreaking for the city’s first so-called energy-positive homes. While the technological feat itself is significant, perhaps as noteworthy is the fact that public officials and private ­builders agree such homes can be built using straightforward designs and materials that won’t break the bank. Urbanica is one of three companies selected by the city to design and construct 10 energy-positive homes — those that produce more energy than they consume annually — on city-owned land in Roxbury and Jamaica Plain. Eleven teams ­submitted proposals in a city design competition for the ­development rights, and city officials said the high level of ­interest will lead to additional projects in coming years. Construction of efficient homes is beginning to rise across the United States. Although there is no accurate count on the number of energy-positive homes, commercial contractors have started building them around the country. Depending on the market where they are being built, prices range from $180,000 to $400,000. The Urbanica project achieves its energy-positive goals largely through the use of rooftop solar panels, although the homes have numerous other energy-efficient features. City officials said homeowners should be able to sell excess power to their electric company and use the proceeds to further lower their utility costs. Each of the four town homes will have 39 solar panels that should produce more electricity than a typical household consumes during a year. 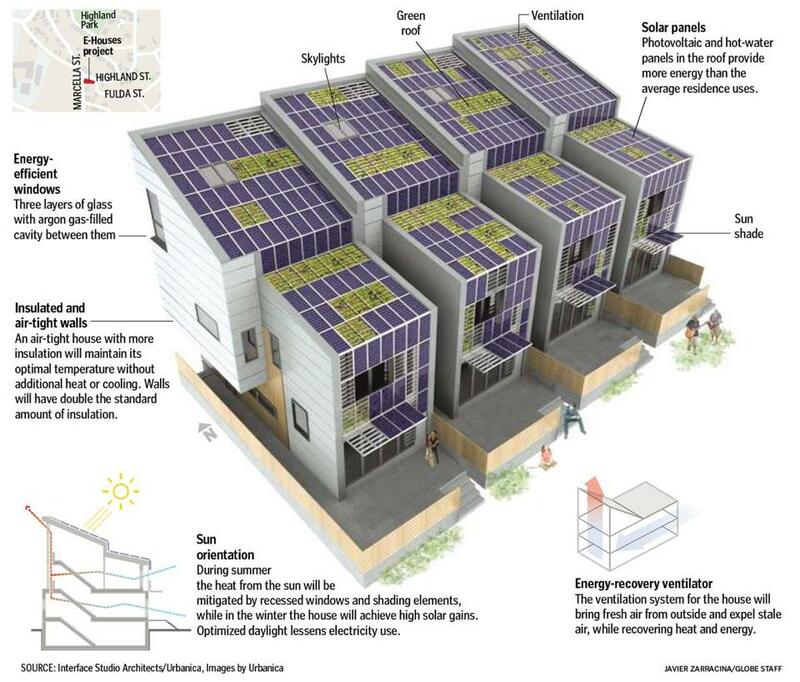 The ­houses will face the sun so they need less electricity for lighting during the day, and will be ­air-sealed and have double ­insulation to maintain comfortable temperatures without as much heating or cooling. Other measures include high-efficiency windows, Energy Star-rated appliances, and a smaller heating system that uses less duct work and electricity. The houses will have three bedrooms, 2½ baths, and about 1,800 square feet. Specialists in energy-efficient building say that demand for such homes has risen ­significantly in recent years, ­especially as home builders try to differentiate themselves by emphasizing environmentally friendly products. “We’ve got builders trying to focus their entire product line in this direction,” said Drew Smith, president of Two Trails Inc., an energy consulting firm in Sarasota, Fla.
Smith said his business has grown consistently in recent years, even as Florida’s housing market has struggled to recover from the foreclosure crisis and broader economic downturn. He is now looking to expand to Las Vegas. In Boston, Dillon said, the three builders designated by the city will price their homes for less than $450,000. In addition to the Urbanica project, GFC Development will build two town houses at 64 Catherine St. in Jamaica Plain, and a team of Sage Builders and Transformations Inc. will build four homes at Highland Park in Roxbury. The latter two ­projects are expected to start by early­ next year. Dillon said the city has not set a specific goal for the ­number of energy-positive homes it wants to build in ­coming years, but it is already beginning to explore additional development sites.